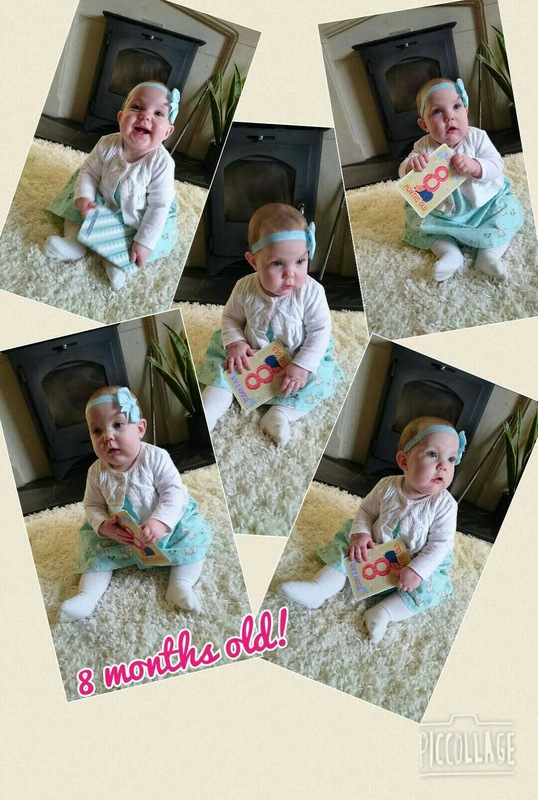 Oops, bad Mummy and bad blogger I completely forgot to write Elarna's 8 month update! With Christmas and all that jazz I must have just overlooked it (I took the pictures I just forgot to write the post) so I'm rolling her 8/9 month update into one. The last update I did was 7 months and it doesn't feel like it was that long ago but it was November! I just had a quick read myself and I'm amazed at how much she has come on in the last couple of months. So here we are 9 months down the line, this little poppet has been on the outside as long as she was on the inside, madness! So what has Elarna been up to in the last couple of months (apart from annoying her brother)? I mentioned in her last update that we had one tooth and another starting to appear, well I can confirm that they are well and truly out now and we are awaiting the appearance of the top 2. These top 2 have been quite the pesky pair and have been causing some upset, little sods. Although she hasn't been overly dribbly she pretty much rams anything and everything in her mouth to have a good chew, she's a grump pants, been quite poorly with them and sleeping has been a tad erratic (marvellous). In fact she's been poorly a handful of times over the last few weeks and I'm putting it all down to these teeth that we are still waiting to show! Her gums are so awfully sore and swollen at times it's difficult to know how to relieve them other than the usual remedies. We plod on though and take it a day at a time. One of my absolute favourite pictures to date. 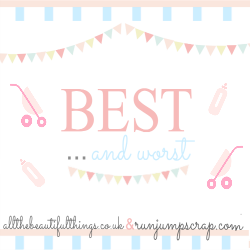 We are well into weaning now and she's starting to get a taste for certain things and is becoming much better at the baby led weaning but is still not sure about lumpy textures which I find weird if I'm honest, I thought she would be a bit better with lumps but not so much. She seems to gag quite a bit on things that are lumpy but isn't too bad with actual food. I don't know why I've developed this odd thing about baby led weaning, it must stem from Alfie choking when he was younger and although his gag reflex kicked in it's clearly traumatised me as I worry when I see Elarna with chunks of food. That being said she really enjoys being able to pick the food up and feed herself and he hand/eye coordination is brilliant. Perhaps I need to relax a little. Having just started at nursery they have informed me that she's eating well with them and experimenting with flavours so I'm pleased with that. As well as continuing to be an actual speed demon when crawling, Elarna is now pulling herself up at every opportunity and is cruising around the furniture. She has stood unaided for a few seconds recently too and it's clear to see her confidence is increasing each day. She gets into every nook and cranny and I really have to be careful about what she seems to find as it then goes straight in her mouth (cue scary moment and over protective mummy alert!). Trying to get pictures of her sitting still are almost impossible these days and require some determination from me to get her to pose.......mainly silly faces and crazy noises to get her attention! She's then off again and ready to bug her brother while he plays. One thing that has been difficult is as she is now so mobile and into everything Alfie gets quite stressed as she obviously has no concept at the moment that he doesn't want her playing with his toys or destroying his train track. I decided the best bet was to purchase a play pen, the great thing about this particular play pen is that it can be turned into an extendable room divider, meaning that when she's a bit older and I need to separate her from Alfie to give him peace I can! Fingers crossed my theory works. Elarna has also very much found her voice this month, my god this child can shriek, wail and whinge for England!!! Noisy little monkey that she is. I definitely don't remember Alfie being quite so high pitched, I'm sure he was at times but Elarna could wake the dead with her shrieking I'm sure. Alfie is definitely settling into his role as big brother, there is much less of the pushing, biting and shoving now (thank god) and more tender and caring moments, when she does start to annoy him he now finds her one of her own toys to play with and the crisis is mainly averted! It's a beautiful thing to watch them develop as siblings. Such a lovely way to remember all of the precious milestones. Your little girl is adorable. Once she's actually walking she'll probably become her brother's new best friend. Once my little one could walk Miss Tot suddenly recognised him as a playmate and they've not looked back so far. She has changed so much!!! Hooray for her starting to get the grips with BLW. I definitely found it so much more convenient with an older one to feed too! Sounds like she will be finding her walking legs early. My 13 month old is starting to walk however finds it all so exciting that he can't get balanced enough to get very far! The developments around this time are just amazing aren't they. Your daughter is a little poppet. It goes so fast doesn't it. I'm not surprised you forgot to update last month with christmAs happening on top of everything else. Elarna is such a little cutie and how lovely of Alfie letting her play with his toys. That is something my son struggles with massively lol. Ah she's adorable and growing so quickly. Those age cards are so cool, wish I had though of that. Awwww, she is just gorgeous! And the bath picture is just too cute for words! You are very good to update every month (forget the little blip this time!) I didn't start blogging until mine were 2, and 18 months, so too late for those kinds of updates, but if I'd started sooner, it would've been nice to have permanent reminders of what they'd been up to! Their first year goes by so fast. I really wish I had discovered blogging earlier on in my motherhood journey so that I would have had more documentation of my kids growing. I remember that stage of "everything in the mouth" all too well. I was constantly cleaning the floor and making sure there was nothing of choking hazard on the floor. Thanks for hostessing #bestandworst. Fancy Some Makeup? Competition Time! How to Avoid Overspending in 2016!